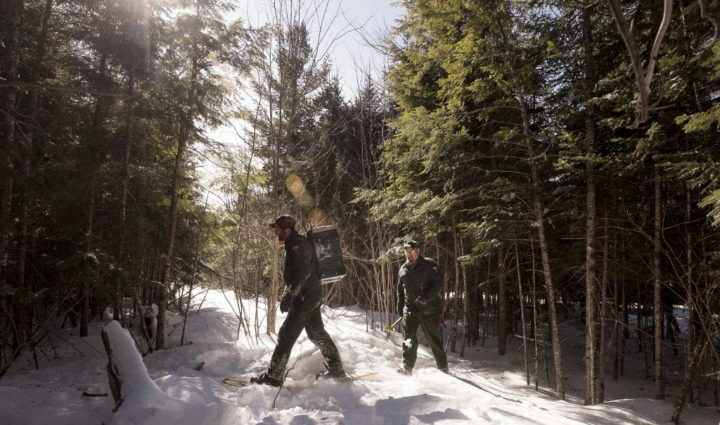 EDINBURG, Maine — Longtime wildlife biologist Randy Cross didn’t know exactly what he and his team would find in the snow-covered bear den they visited on Wednesday morning. He didn’t know exactly how many cubs the mother bear, named Funk, would be nursing. 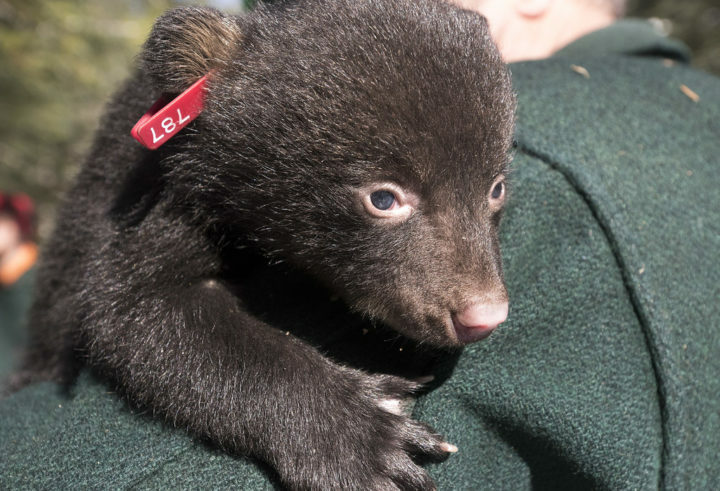 He didn’t know if he’d be able to recognize the cub that members of the Maine Department of Inland Fisheries and Wildlife’s bear monitoring project tucked into the den a month ago, after its mother ran off and it nearly froze to death. But he did figure Funk and the cubs would be faring just fine. As the Maine Department of Inland Fisheries & Wildlife team is finished checking the bear cubs they put them back near the mother during a den visit in Edinburg. They inject the mother with a drug so she will go to sleep while the team gathers data about her and her cubs. Over the course of an hour or so, the crew located that den, sedated Funk, hauled out four yowling cubs, then took measurements, attached ear tags and took biological samples. And that orphaned cub that had spent the last month with a surrogate mom? Cross was able to pick him out pretty easily after all. After looking the cub over a bit more carefully he was sure he found signs of frostbite that proved the bear was one of the surviving orphans. “See the scars on the backs of both ears?” Cross asked. Lisa Feener, a wildlife technician with the Maine Department of Inland Fisheries & Wildlife, checks one of the four bear cubs in a den while working on the bear monitoring project in Edinburg. Cross said that when dealing with orphaned cubs, the crew often paints their toenails with fingernail polish so they can be identified after being placed in a surrogate den. This time there was no polish available, but it didn’t matter. 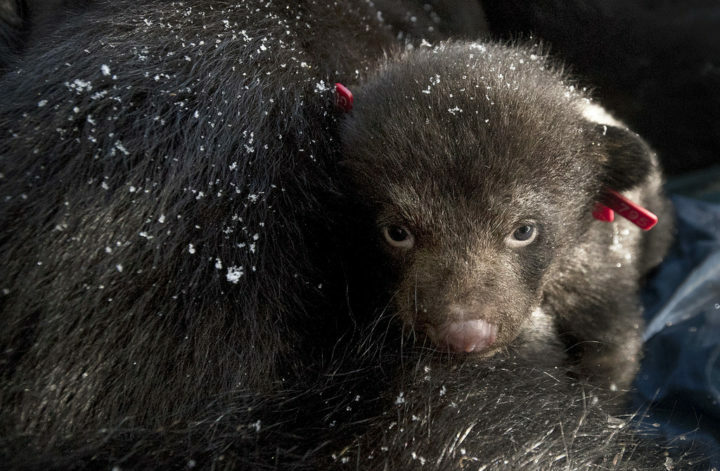 Making the identification easier: The orphaned bear may have been born a week earlier, and was bigger than any of his adopted siblings. 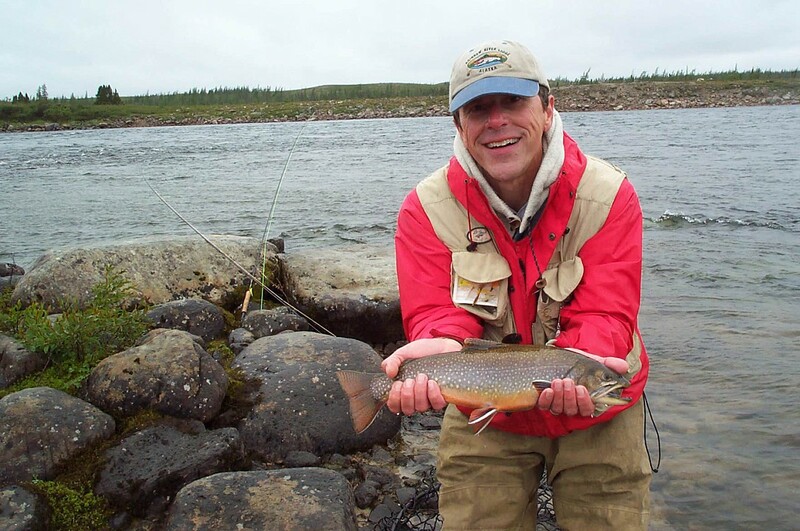 It weighed four pounds, compared to about three pounds for each of the nearly identical others. Three cubs were left alone in the cold on Jan. 31 when a piece of logging machinery passed close to their ground nest — a large depression in the earth. Their mother fled the ruckus, and didn’t immediately return, and the logger contacted the Maine Warden Service to ask for help. One of the bear cubs hangs onto the shoulder of wildlife biologist Randy Cross as the Maine Department of Inland Fisheries & Wildlife team conducts a den visit in Edinburg. Warden Paul Farrington, with guidance from Cross, rescued the three cubs, warmed them up, and they were subsequently tucked into the dens of two other adult female bears. Both mother bears were easy to locate because each had been fitted with a radio collar by biologists in the execution of the state’s long-term bear monitoring project, for which Cross oversees the field work. 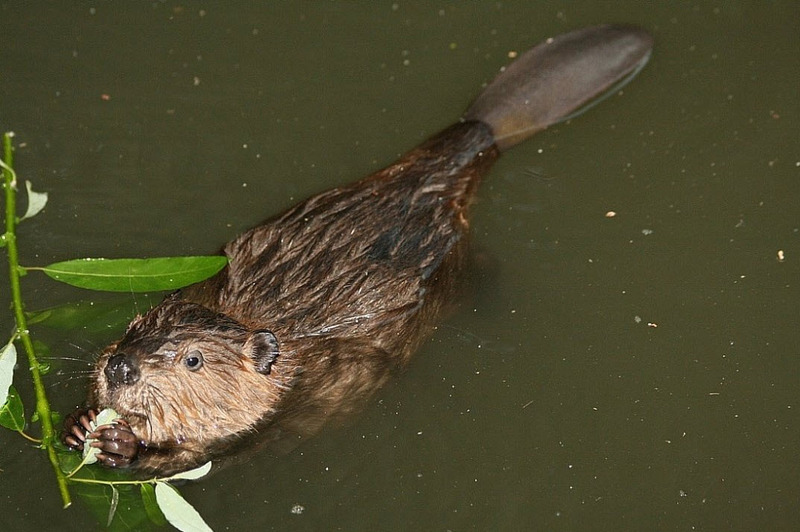 Cross and the crew — Feener, Ethan Lamb and Lisa Feener — visit each of the adult females in the study group each winter, hoping to learn how many offspring they have had. Then, a year later, they check on those bears to see how many yearling bears have survived to head back into the den for another winter. This year, that means 78 den visits for the crew. 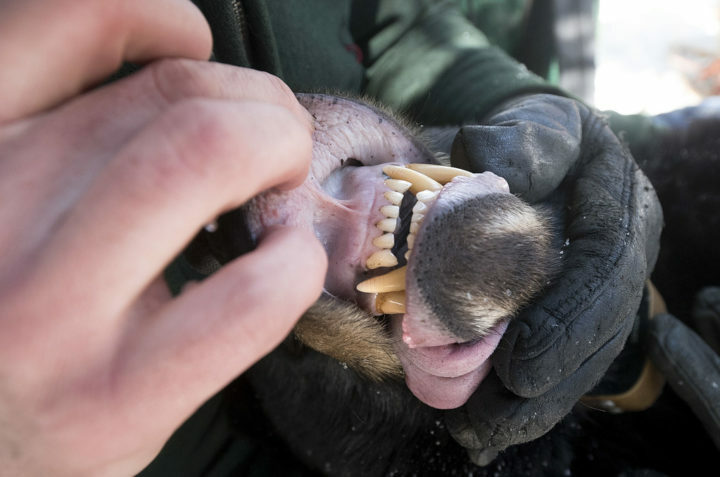 Maine Department of Inland Fisheries & Wildlife technician Ethan Lamb checks the mother bear’s teeth while working on the bear monitoring project in Edinburg. During the January relocation effort, the adult female bears were not sedated. Instead, crew members moved stealthily to the den site and placed the cub or cubs within reach of the mother bear. In each case, the mother bear welcomed the cub as if it were her own, and tucked it neatly underneath her body for warmth. Had there been more cubs, had they been faring poorly, or had Funk’s condition not seemed up to par, the crew may have decided to put one or more cubs into yet another den to help them flourish. That wasn’t necessary. 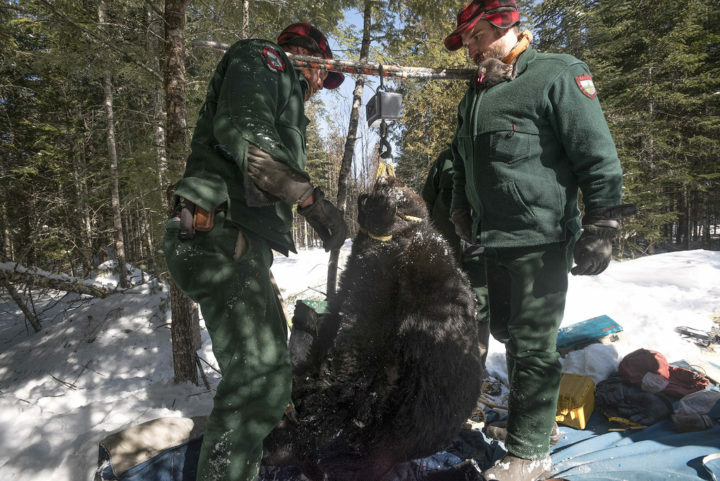 Maine Department of Inland Fisheries & Wildlife technicians Jake Feener (left) and Ethan Lamb lift up the mother bear to weigh her before placing her back into the den with her four cubs while working on the bear monitoring project in Edinburg. Funk weighed a healthy 165 pounds — much higher than any of the crew estimated — and at the end of the process, Funk and the four cubs were tucked back into a renovated den. Feener then grabbed a cell phone that was recording a BDN Facebook Live video and showed viewers a bears-eye view of the winter abode. 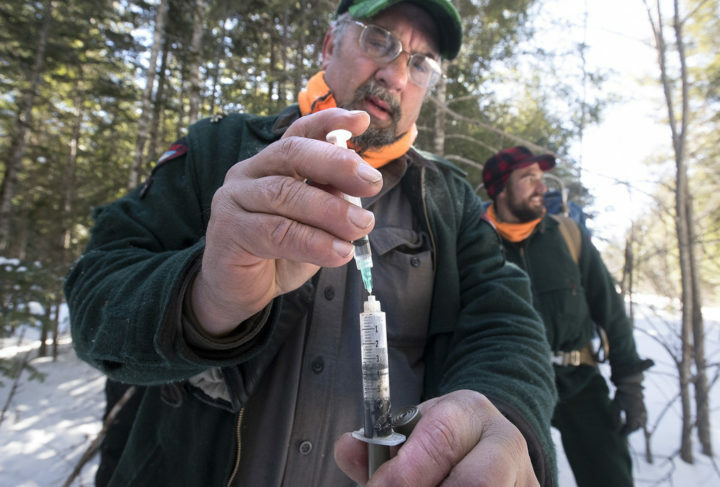 Randy Cross, wildlife biologist with the Maine Department of Inland Fisheries & Wildlife, puts a tranquilizer in a syringe before approaching a bear’s den while working on the bear monitoring project in Edinburg. They inject the mother with the drug so she will go to sleep while the team gathers data about her and her cubs. Ten minutes later, all five bears were safely snuggled back into the den, where they’ll spend the next several weeks before emerging. But the day wasn’t over for Cross and the bear crew. They had miles to travel before their day was over. And they had another mother bear or two to visit. As the Maine Department of Inland Fisheries & Wildlife bear team is finished den visit in Edinburg they head to another site.